A big new update is out today for Eve Online, and it allows players to head outside the normal boundaries of space. The Into the Abyss update adds the Abyssal Deadspace, a new PvE area with a new civilisation to encounter, plus new equipment and quality of life enhancements. The biggest addition in the update is the Abyssal Deadspace, which is a kind of transdimensional conduit of connected areas. You’ll be able to reach it by activating an Abyssal Filament, which are now found in exploration sites and on the marketplace. Once you activate a filament, you’ll be able to start making your way through the Abyssal Deadspace, which is series of “pockets” that CCP says will take players about 20 minutes to complete each. It’s meant to be a survival style PvE gauntlet that players of all experience levels can explore. Explore the vastness of this universe and others with our list of the best space games on PC. The Deadspace is inhabited by a new civilisation, the Triglavian Collective. They have unstable but advanced technology that players can use to enhance their modules – but the effects are unpredictable, and may end up making equipment less effective rather than more. 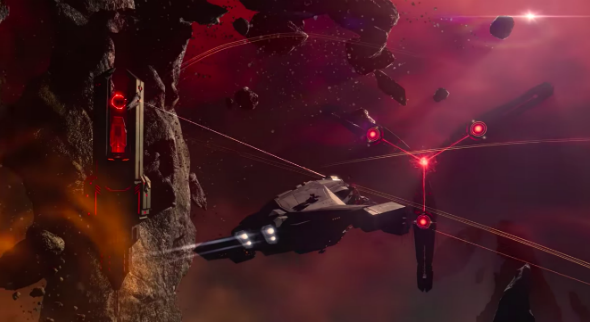 The Triglavians are also armed with a brand new kind of weapon, the Entropic Disruptor, and players who have Eve subscriptions will be able to find blueprints for three new Triglavian ships. Here’s a trailer for the update, which is available now for all players. It runs through most of the new features introduced in Into the Abyss. The Abyssal Deadspace format will allow you to immediately get into the action while the company tests “new and brave ideas” for the game, according to CCP CEO Hilmar Veigar Pétursson. CCP has also put work into streamlining the interface for planets and made Eve’s UI scalable, which is sure to be a welcome addition for players using 4K screens. We covered Into the Abyss’ new features announced at Eve Fanfest last month, if you’re curious about the fine details of the expansion.